It makes perfect sense that artist Barbara Probst studied sculpture before moving into a photographic medium, as her work – albeit two-dimensional in the traditional sense – explores the three-dimensional possibilities of image-making by capturing single moments from several angles at once. Since 2000, Probst has been creating her renowned Exposures, taken using a radio-controlled release system which simultaneously triggers the shutters of several cameras pointed at the same event or subject from various angles and distances. As such, her work becomes representative of the different views we have of a shared reality, calling into question the nature of photography both formally, by employing the method of photographic production as a subject in itself, and conceptually, through asking us to confront images with a subjective eye. As Probst told AnOther in an interview: “1960s writers and film directors who broke with the norms of storytelling and filmmaking intrigue me. The writer Alain Robbe-Grillet, for example, or the director Jean-Luc Godard. Their way of storytelling was to go against the expectations of the reader or viewer by creating cracks and gaps in the story or by unexpectedly changing the perspective. They treated the narrative not unlike a Cubist painter treated space. I’m interested in the how-is-the-story-told and not in the what-is-the-story-about.” A recent series of diptychs entitled 12 Moments, created between June and December 2015 and currently on display at Kuckei + Kuckei Gallery in Berlin, are particularly emblematic of Probst’s filmic influences. The artist creates each image from a memory of an experience, and then finds a second picture to accompany it. 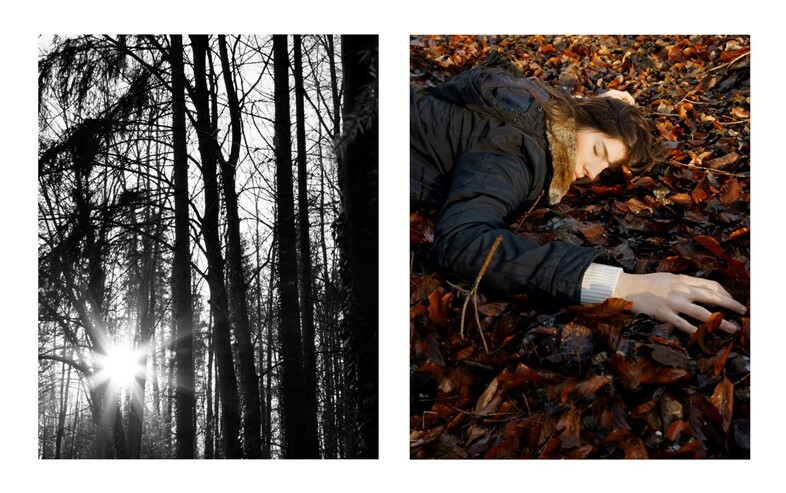 Almost crime scene-like, an image of a forest is juxtaposed with a woman lying on a bed of autumnal leaves; a snapshot of a body falling to the floor sits beside a blurred ceiling; a diptych portraying the surface of a lake appears beside a figure submerged in water. A narrative is formed instinctively in the mind of the viewer; at first, it would appear that the photographs are interlinked, but upon a closer inspection, the ties between the pairs of images become increasingly tenuous, despite the artist utilising visual clues to trick us into assuming they are of the same place and time. With 12 Moments Probst yet again asks us to interrogate the authencity of photography, and the seductive ability that the medium possesses to convince us all that what we are looking at is the truth. 12 Moments by Barbara Probst is showing at Kuckei + Kuckei gallery, Berlin until 10 June 2017.